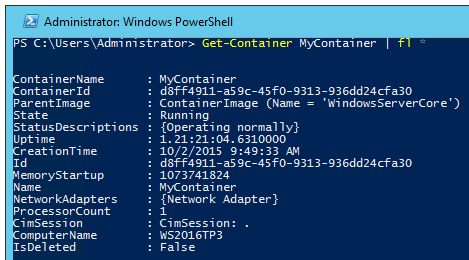 New-Container -Name "MyContainer" -ContainerImageName WindowsServerCore -SwitchName "Virtual Switch"
If you install Windows Containers with Microsoft Documentation, then you should have a virtual switch called “Virtual Switch” in your environment. There is a parameter called “MemoryStartupBytes” but it seems it just changes startup memory. It seems there is no memory or processor limit yet. After start your container, you should configure your Host’s Firewall because Container uses Host Firewall. If you try to configure firewall inside Container, you will get warning. net use administrator /active:yes net use administrator Password1! See you in next part!